Många av oss kommer ihåg när Bildt och Wibble lade fram sina sparpaket när budgetunderskottet skenade när räntorna steg (för att försvara växelkursen) och inkomsterna sjönk när konjunkturen gick ned. Krugman: A very belated but still welcome realization that monetary policy badly needs an assist from fiscal expansion. What we’re seeing in elite circles is a very belated but still welcome realization that monetary policy badly needs an assist from fiscal expansion. If structuring this one-two as helicopter money makes people feel better, fine; but the combined fiscal-monetary push is what matters. För perioden januari–juli i år gav handeln ett överskott på 4,5 miljarder kronor, mot 20,5 miljarder kronor i överskott under samma period i fjol. Varuexporten uppgick i juli till 85,1 miljarder kronor, medan varuimporten blev 84,6 miljarder kronor. Tsipras also told Realnews that the European Union was “sleepwalking towards a cliff” as the Stability Pact’s tough fiscal rules had engendered deep inequalities among member states. Jackson Hole Eight years after the crash, major economies including the US are stuck with sub-target inflation, ultra-low rates, and economic growth that remains pedestrian. Beneath the surface at the Kansas Fed’s annual symposium at Jackson Hole, many economists remained anxious. Without action from lawmakers in countries including the US, where Congress has a history of bitter budgetary deadlocks, they could be trapped in a low-growth rut that leaves them hugely vulnerable when the next downturn comes. Sandbu As the world’s central bankers gather at Jackson Hole on Thursday night, one economic phenomenon will hover over their deliberations more than any other. That is the large and growing share of loans around the world that bear a negative nominal interest rate: creditors paying their debtors to borrow. Weldon attributes this squarely to the wrong mix of fiscal and monetary policy. But is it also the main cause of low interest rates? Weldon seems to take this as a given, concentrating instead on the political economy puzzle of why such a policy was pursued if it is detrimental to the interest of electorally dominant pensioners. where the Long Slump is at last taking its political toll. The former economy minister says France voted for a left-wing French manifesto four years ago and ended up with a "right-wing German policy regime". the same treaty that he rammed through the French parliament by party whip after it had it had already been rejected by French voters in a referendum - in its earlier guise as the European Constitution. Ambrose China risk of "liquidity trap" forcing a shift towards Keynesian fiscal stimulus. China is at mounting risk of a Japanese-style "liquidity trap" as monetary policy loses traction and the economy approaches credit exhaustion, forcing a shift towards Keynesian fiscal stimulus. Officials at the Chinese People’s Bank (PBOC) have begun to call for a fundamental change in strategy, warning that interest rate cuts have become an increasingly blunt tool. They cannot easily stop companies hoarding cash or halt the slide in private investment. Sheng Songcheng, the PBOC’s head of analysis, set off a storm last month by warning that the economy had “started to show some signs of being caught in a liquidity trap”. The Decade of Zero and its Chaotic Unwinding John P. Hussman, Ph.D. It is a shame that such a dispassionate tone does not permeate the earlier chapters. Mr Stiglitz is at his best when coolly analytical and at his most trying when settling scores. Yet on the essentials, he is surely right. Without a radical overhaul of its workings, the euro seems all but certain to fail. Quantitative easing's failure to quash the threat of deflation is finance's equivalent of the bump in the data that alerted physicists to the possibility of a new boson. he mismatch between economic theory and the real-world outcome of zero interest rates poses a direct challenge to the current orthodoxy that puts a 2 percent inflation target at the heart of monetary policy in most of the developed world. S&P 500 companies posted Q2 2016 earnings for the latest 12 month period at $86.66 per share. So at the August bubble high the market was being valued at a lunatic 25.1X. Greece gained entry to the eurozone by understating the budget deficit for 1999, the benchmark year to qualify for admission, then continued to massage the figures, brushing aside repeated warnings from Eurostat about the methodology used by the government’s statistics unit. Greklands BNP krympte med 2 procent i fjol. I år och nästa år och väntas BNP minska med 4 respektive 2,6 procent. Stiglitz Canada and the US trade to mutual advantage without any of the trappings of a single currency, single market or free movement, so there is an alternative model. If the euro is not working, and if, as Stiglitz argues, it is actually making things much worse, then the cross-border infrastructure should be created so that it does work. Otherwise, if this is too much integration for Europe to stomach, the euro should be abandoned. 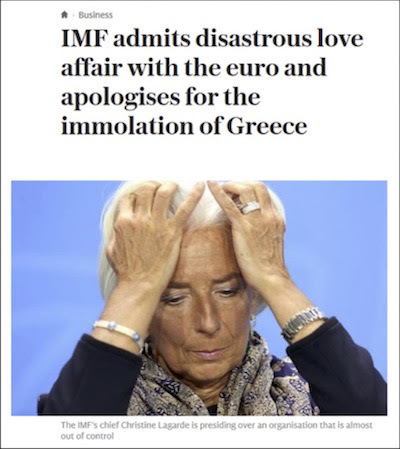 The bias developed because, as Ambrose says, the European elites in the IMF have waged a massive love affair with the euro. And like many in love, they simply could not see the flaws in the object of their affection, the common currency of the eurozone. It was at the very foundation of the whole European project in their eyes. The IMF-EMU love affair led the agency to accept reports and reassurances from eurozone officials at face value, without the same kind of verification they routinely demand from less-developed countries. Long before the deluge, people within the agency had argued that the euro system was fundamentally flawed and would eventually fall apart. Those who said so found themselves overruled and even punished. In 2013 economists at the IMF rendered their verdict on these austerity programmes: they had done far more economic damage than had been initially predicted, including by the fund itself. Cutting-edge research into cheap and clean forms of electricity storage is moving so fast that we may never again need to build 20th Century power plants in this country, let alone a nuclear white elephant such as Hinkley Point. You can track what they are doing at the Advanced Research Projects Agency-Energy (ARPA-E). Monetary policy is close to the limits. Only fiscal policy can address a structural economic shock. A soft-landing depends on Chancellor Phillip Hammond delivering on his pledge to “take any necessary steps to support the economy and promote confidence”. The result of extreme financialization was enormous inequality and profound vulnerability. But at least the West’s working class had access to cheap loans and inflated house prices to offset the impact of stagnant wages and declining fiscal transfers. Then came the crash of 2008, which in the US and Europe produced a massive excess supply of both money and people. While many lost jobs, homes, and hopes, trillions of dollars in savings have been sloshing around the world’s financial centers ever since, on top of more trillions pumped out by desperate central banks eager to replace the financiers’ toxic money. One might think that after they /economists/ failed to anticipate the greatest financial crisis since the Great Depression, they learned to step back and look at the big picture. Instead, we're seeing the same blind spot: a pre-crisis dependence on the wrong data set of post-World War II recessions, which led to the biggest blunder in economic history. The proper frame of reference, as Carmen Reinhart of the University of Maryland and Kenneth Rogoff of Harvard University explained in 2008, are debt-induced financial crises. The defining characteristic of any recovery from a credit crisis is ongoing debt deleveraging, meaning that households, companies and governments are primarily using any economic gains in income or borrowing costs to reduce their debt. Eventually, we will slog our way back to “normal” -- whatever that is. In the meantime, we should expect the ongoing recovery to look like that of Japan's in 1992, Finland's in 1991, Sweden's in 1991, Norway's in 1987 and Spain's in 1977 -- all of which were slower, weaker and less comfortable than the usual post-war recessions.